The symposium will be held at McCourtney Hall. All are invited to attend the annual ND-Purdue Symposium on Soft Matter and Polymers. Hosted by the University of Notre Dame and Purdue University, the event will take place at Notre Dame’s McCourtney Hall on Saturday, October 6 from 8:15 a.m. to 5:45 p.m. EDT. At the one-day event researchers will hear from invited speaker, Nathan Gianneschi, Jacob & Rosaline Cohn Professor of Chemistry, Materials Science & Engineering, and Biomedical Engineering at Northwestern University, on his project titled, “Making peptides into medicines: From Enzyme-responsive nanomaterials to protein-like polymers.” Additionally, faculty from Notre Dame, Purdue, and the University of Illinois will present on varying topics. Graduate students and postdoctoral scholars are also invited to showcase their research during the afternoon poster session. The event is open to the public including faculty, postdoctoral scholars, and students interested in polymers and soft materials. All those who plan to attend, including potential poster presenters, should register by September 26, 2018. In addition to Gao, other co-coordinators of the event are Matthew Webber, assistant professor of chemical and biomolecular engineering at Notre Dame, and Jianguo Mei, assistant professor of chemistry at Purdue. To view the full symposium agenda or to register, please visit https://nano.nd.edu/opportunities/annual-workshops-symposia/5th-annual-soft-matter-polymers-symposium-and-poster-session/. The Center for Nano Science and Technology (NDnano) at the University of Notre Dame promotes collaborative research in science and engineering to address unsolved scientific and technical questions with an aim to promote the greater good. 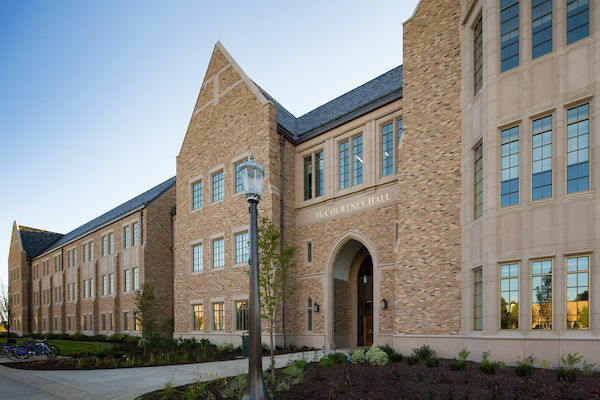 NDnano is where Notre Dame faculty, researchers, and students meet to broaden understanding, discuss multidisciplinary research opportunities, and shape future research directions. To learn more about NDnano, please visit nano.nd.edu. Originally published by Brandi Klingerman at research.nd.edu on September 19, 2018.